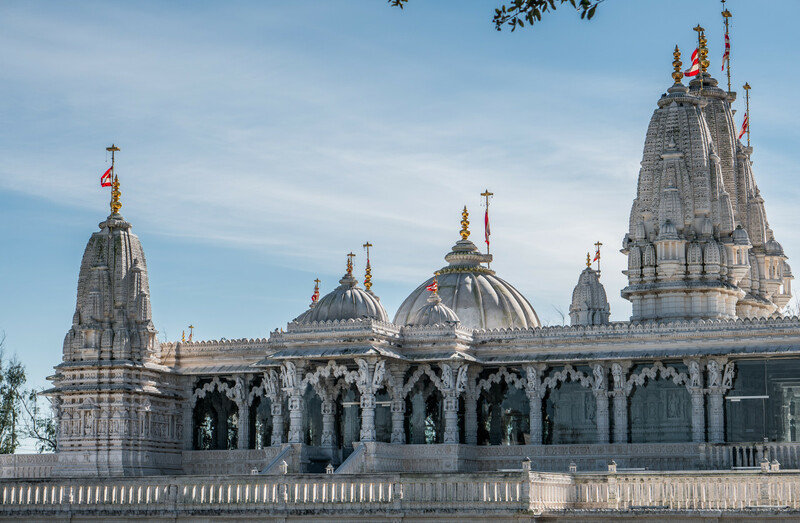 Deep in the suburbs of Stafford, Texas is not your everyday neighborhood playground yet instead a hidden Hindu temple made almost entirely out of white Italian marble with an immaculate attention to detail. This temple is a BAPS Shri Swaminarayan Mandir. The Mandir is a traditional place of Hindu worship designed and constructed entirely according to ancient Vedic architectural texts. In September of 2000, the foundation was formed to withhold what is today over 33,000 pieces of Italian marble and Turkish limestone that were hand-carved by skilled craftsmen and assembled by volunteers in just 11 months folllowing guidelines outlined in ancient Hindu scriptures. 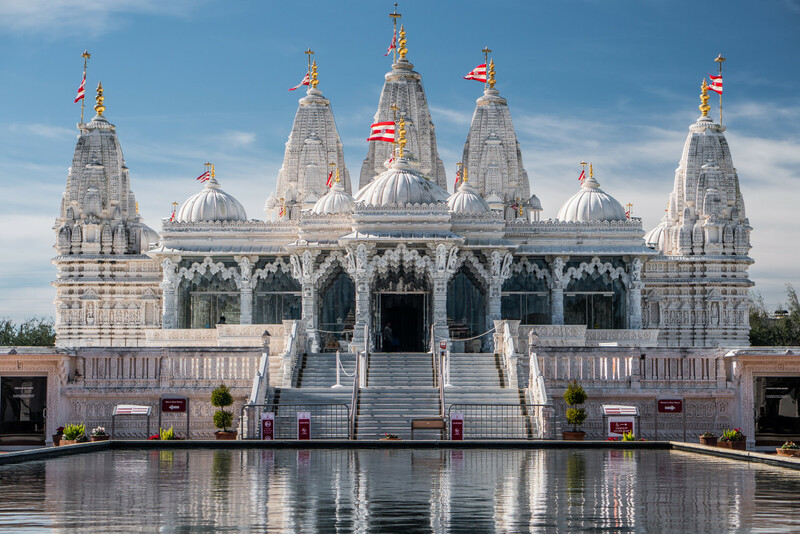 The temple was built by the BAPS Swaminarayan Sanstha, which is headed by Mahant Swami Maharaj, and is a type of ‘Shikarbaddha’ mandir, built according to principles laid out in the Shilpa Shastras, Hindu texts prescribing standards of sacred architecture. 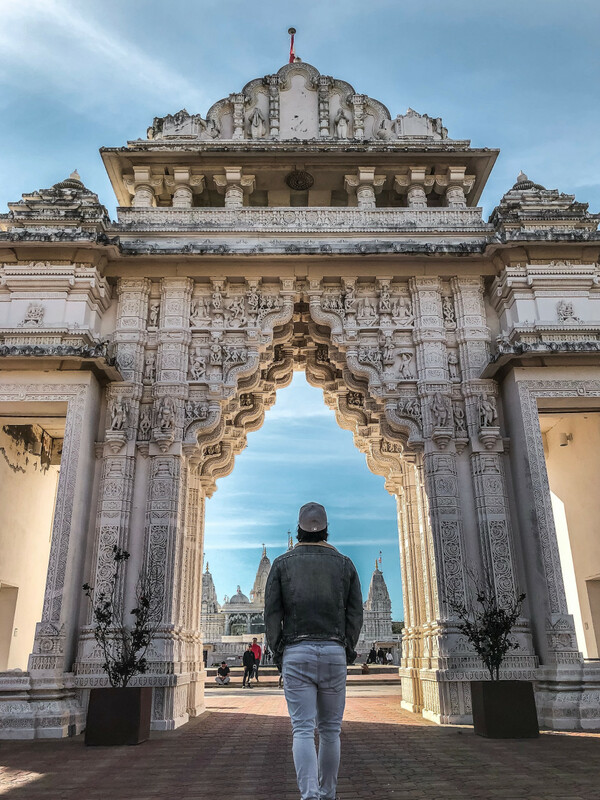 Stone-laying began in 2002 when the first carved piece arrived in Houston, along with 33,000 other pieces of marble and limestone that had been hand-carved in India by 2,400 artisans. Each marble piece fits together in a tongue-and-groove fashion similar to a three-dimensional jigsaw puzzle. Not one piece, including the 4-foot foundation, contains a single piece of iron or steel. 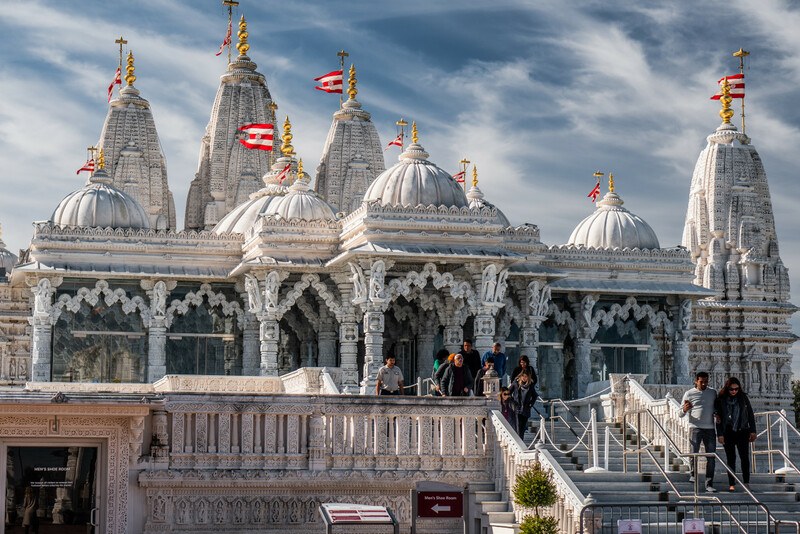 The mandir is 73 feet high, 125 feet long and 95 feet wide. The 11,500 square foot base is surrounded by a 25,620 square foot deck. The detail in the columns and walls include carvings of deities, dancers, musicians, elephants, horses, flowers and geometric designs. On 25 July 2004, the mandir was officially inaugurated. The murtis were installed in the shrines, after which they were consecrated by Pramukh Swami. Within the mandir, murtis (sacred images of the deities) have been installed in different shrines. The central shrine holds the murti of Swaminarayan, with Gunatitanand Swami to his left, together worshipped as Akshar-Purushottam Maharaj. Similarly, different shrines hold murtis of other Hindu deities such as Radha Krishna, Shiva Parvati, Sita Ram, Hanuman, Ganapati and the lineage of BAPS gurus who are Swaminarayan's spiritual successors. The Understanding Hinduism exhibition provide visitors with a foundation of the key tenets of Hinduism. The mandir is open daily for worship and to visitors.